SARA KORNFELD SIMPSON, 18, is a sophomore at Boston University, pursuing a dual degree in Music Performance (flute and oboe) and Neuroscience as a Trustee Scholar. She studies flute with Linda Toote and oboe with Mark McEwen, and plays in the Boston University Symphony Orchestra, Wind Ensemble, and chamber music ensembles. Sara was a YoungArts winner in Classical Music/Flute in both 2014 and 2015, and toured Europe with the Boston Philharmonic Youth Orchestra in summer 2015. She was Valedictorian of the Class of 2014 at Patrick Henry High School in San Diego, California, and is a Davidson Fellow Laureate. Throughout her high school years, Sara was principal flute in the San Diego Youth Symphony’s Wind Orchestra and principal oboe in its Symphony and Philharmonia Orchestras. Sara performed flute concertos at the California Center for the Arts in June 2013 and at Copley Symphony Hall in June 2011. 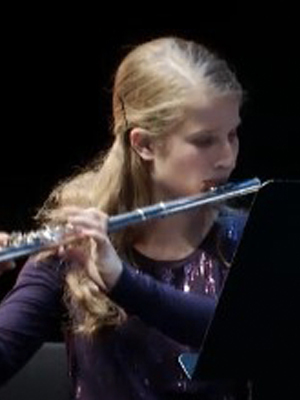 In June 2012, she was one of 10 flutes selected to appear with the National Honor Concert Band at the Kennedy Center. That spring she also won a second place award at the Intel International Science and Engineering Fair. In the summers, Sara participated in the National Symphony Orchestra’s Summer Music Institute, the Tanglewood Institute Wind Ensemble, the Nova Scotia Chamber Music Festival, and other orchestral programs. Sara was the onstage flute soloist in La Jolla Playhouse’s production of A Midsummer Night’s Dream in summer 2010. She also enjoyed mentoring young musicians and playing for senior citizens in retirement communities. Sara is a member of the Center for Development of Arts Leaders (CDAL) in Boston.